What with so many developers trying to focus on player choice within a narrative, linear story telling has taken a hit in the seventh console generation. Most notably, it seems, within the crime/mystery genre, which has been a rather quiet little niche outside of LA Noire. But outside of Cole Phelps and his over the top matchbox analyses, there are still gripping mystery thrillers to be told, and still developers willing to tell them. All though significant problems prevent The Raven: Legacy of a Master Thief from being anything special, KING Art and co. have crafted a solid point-and-click mystery, with more than its fair share of twists and turns. Unlike most adventure games, The Raven does not create a good first impression. At the beginning of the first of the game’s three episodes, the player is placed in the shoes of Constable Anton Jakob Zellner, a member of the Swiss police force during the 1960s. 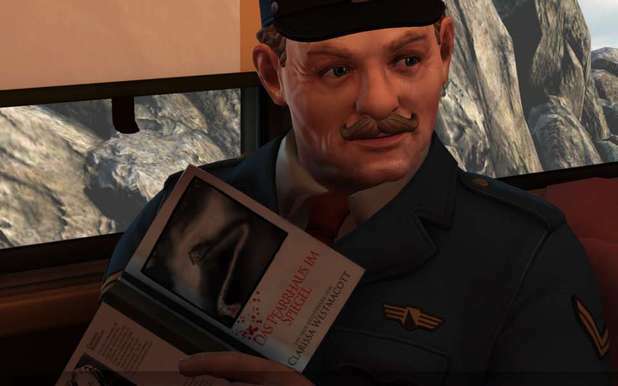 Constable Zellner has been posted aboard a train journey to Venice, the passengers of which include the famed Inspector LeGrand – the man responsible for allegedly catching and killing the eponymous Raven several years ago. 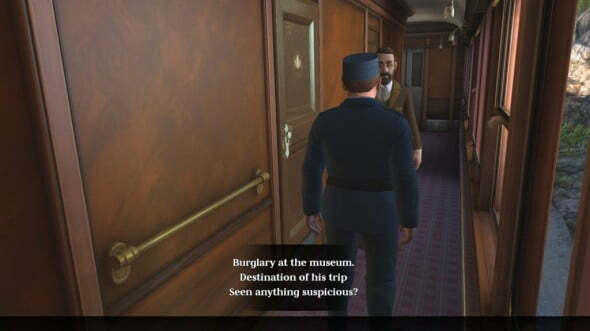 The inspector is protecting a precious jewel that is being transported to a museum in Cairo, and is suspicious of an attempt to steal the jewel from out of the train’s cargo hold. Eager to prove himself as a budding detective, Zellner pitches in to assist the inspector with his investigations. Although the prospect of playing as the lowly constable as opposed to the famous, dashing inspector is certainly an interesting one, and the short, plump and rather old constable certainly makes for a refreshing change as a protagonist, the game’s first act is actually rather dull for the most part. 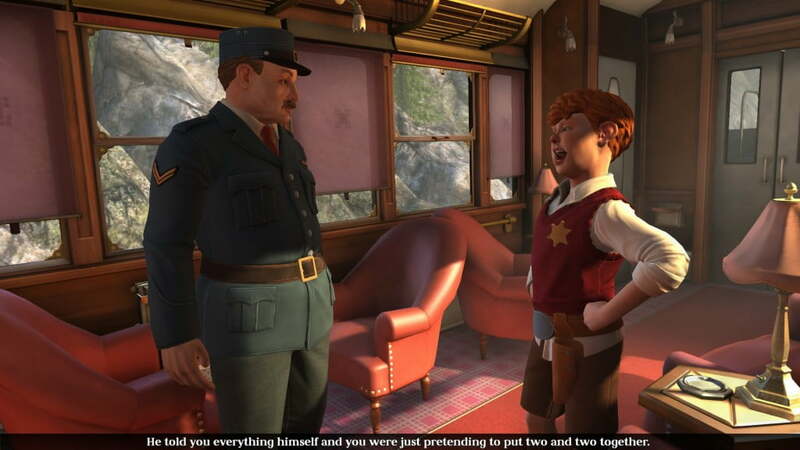 For the first hour of the episode, Zellner wanders around the train conversing with passengers and solving petty crimes, usually through objects combination and logic puzzles.During this rather lacklustre opening, the player learns the ins and outs of The Raven’s gameplay mechanics. It should be noted that, as a port from the PC, The Raven’s control set up has been very poorly optimized for the Xbox 360 gamepad. One must use the analogue sticks to move Constable Zellner, and must press the A button the use or examine items, which often makes the constable manoeuvre slowly and sluggishly around his environment, occasionally missing important clues that pop up as magnifying glass icons in the area. This awkward movement was particularly frustrating within the train’s cramped cabins, and it would often take me a significant amount of time to get Zellner to move where I wanted him. This, and the game’s penchant for making the player backtrack between areas multiple times and sit through several loading screens, makes for a rather tepid and frustrating first act. Towards the first act’s climax, however, things intensify a great deal, and The Raven‘s narrative starts to pick up the pace. When an attempt is made to steal the jewel, Zellner and company become embroiled in an exciting race to catch The Raven, whom they believe has returned to exact revenge upon Inspector Legrand with one final heist. From this point onwards, The Raven opens up into a full blown thriller, and deals with many of the problems its first act presented. While The Raven’s first act lulled us into a near comatose false sense of security, the game’s second act throws numerous twists and shocking developments into the mix, and the game finally presents us with a plot, and several unanswered questions. to sink our teeth into. Things also open up spatially, allowing for easier movement and puzzle solving in larger areas. Perhaps The Raven’s most interesting twist is its shift in perspective midway through episode 2, wherein the player takes on the role of one of the perpetrators of the crime, rather than the loveable constable. This ostensibly splits The Raven into two games, one half of which is focused on fact finding and crime solving, and the other half of which is focused on espionage and secrecy. 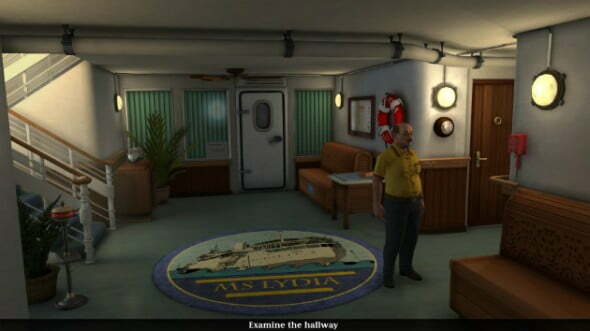 Although gameplay is still mainly centred around logic puzzles and item combination puzzles (which are at times well devised and engaging, and at others poorly conceived and downright silly), this tonal shift certainly makes the game more interesting, as does seeing previously witnessed events play out from a different point of view. The game’s once rather dull characters also become more fleshed out as the second acts rolls around, a pattern which continues to the very end and throws in some twists that leave a lasting impression on the player. Unfortunately, this penchant for ballsy twists actually harms The Raven as its third act hits its climax. Without spoiling what will undoubtedly be a surprise ending, the game’s big reveal – though brave and admirable it may be – makes very little sense within its own continuity of events. The Raven is also a rather odd mix visually. The game’s characters look rather like animated plasticine models of Tin Tin characters, which is actually a rather charming art style that fits in well within the game’s context as a 1960s crime thriller. There are however, far too many visual bugs and glitches, ranging from characters’ jaws becoming unhinged as they speak (a minor and rather humorous bug), to the player character getting stuck in an area where the camera does not follow, stopping them moving entirely and preventing the player from continuing with the game. The game does however boast a rather magnificent score, with some of the catchiest motifs I’ve heard outside of AAA games or 8-bit composers in a very long time. Each piece fits in brilliantly with the environment on screen, and underscores the mood and tone of the events that are transpiring. Although it is unlikely it will see such recognition, The Raven should be a shoe in for at least one award for best soundtrack of 2013. Once puzzles have been ironed out and the narrative starts to pick up, The Raven starts to resemble a wonderfully accomplished little crime story; at times as oddball and cheesy as an ITV mystery drama, and at others as tense and gripping as the finest Sherlock Holmes stories it most certainly draws influence from. Although its opening is about as interesting as a wet biscuit, The Raven soon becomes an intense and gripping thriller with a very engaging story to tell. 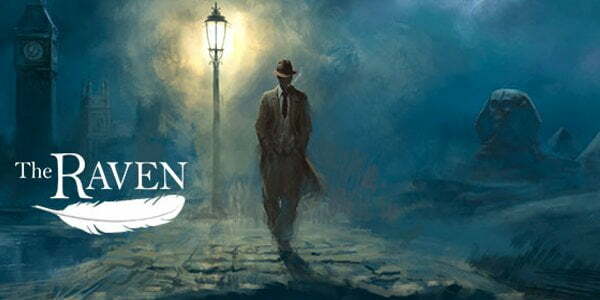 Bugs and glitches might be off putting for those looking for greater polish, but if you’re after an intriguing mystery game, The Raven should have you covered.